This striking photographic journey shows how Tony Brown became the King of Nashville: from pianist for Elvis Presley, to president of MCA Records Nashville, to producer of over 100 number-one country songs that are beloved by millions. 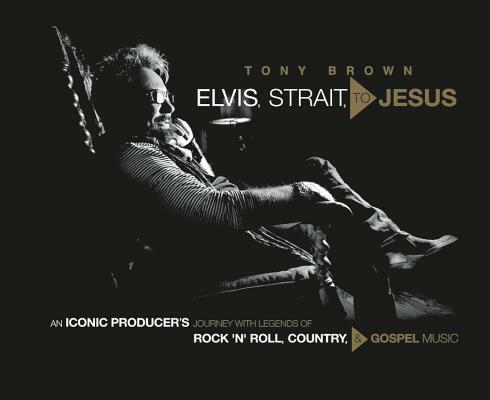 ELVIS, STRAIT, TO JESUS celebrates a music icon's legendary rise, his history-making industry relationships, and how these friendships gave us the songs we still live by. George Strait - Reba McEntire - Trisha Yearwood - Brooks & Dunn - Vince Gill - Lionel Richie - Lyle Lovett - Patty Loveless - Steve Earle - Rosanne Cash - Emmylou Harris - Jimmy Buffett - Marty Stuart - Bernie Taupin - Don Was - William Lee Golden - Rodney Crowell - David Briggs - Glen D. Hardin - Donnie Sumner, and more. Tony's fascinating anecdotes accompanying the photos unveil the encounters that led to mega-hits by George Strait, Reba McEntire, Trisha Yearwood, and countless others; he recounts how he became the accidental founder of Americana music with the edgy signings of Steve Earle and Lyle Lovett to MCA, as well as his unforgettable memories of life on tour with Elvis Presley. He also retraces his North Carolina roots and honors the legends of rock, country, and gospel with whom he forged an inimitable music legacy. This special tribute is one that no fan of music or artistic photography should be without. Tony Brown is the iconic music producer with over 100 million in record sales and over 100 number one singles to his credit. From humble Carolina roots as a child pianist in his family's band, to backing Elvis Presley on keys, to producing multiple hits for George Strait, Reba McEntire, Trisha Yearwood, and others, Tony's 40-year career has singularly marked musical history. As President of MCA Nashville for nearly two decades and co-founder of Universal South Records, Tony has impacted countless artists' careers and the American cannon of music in multiple genres. Elvis, Strait, to Jesus, the coffee table book celebrating his musical life, legacy, and friendships in pictures, is coming from Center Street in spring 2018. "Tony has a place in music history, and in the hearts who've worked with him and loved him, that is uniquely his own."